Payforit is a carrier billing service that provides users with the option to make online payments using their smartphone. Payforit is jointly owned by mobile operators Three, EE, O2, and Vodafone. In 2003, T-Mobile, Orange, Telefonica, and Vodafone formed a consortium to create a platform for consumers to make payments online via their mobile phones. The platform was meant to work with all operator networks and there were plans to create a framework across all of Europe. The service was initially launched in Spain, but plans for expansion were scrapped in 2005. As a result, the UK founders of Simpay started work on their own project called Payforit, which they launched in the United Kingdom in 2007. In fact, the service is designed for purchasing solely digital goods such as apps and games. It can also be used for purchasing services as well as for gambling purposes. Still, it is worth noting that the payment method cannot be used when you wish to buy physical goods. Payforit charges your mobile carrier, who in return puts those charges on your phone bill at the end of each month’s payment period. The service is available on every mobile carrier in the UK and can be used on both prepaid and standard plan phones. If you have a prepaid plan, the charges will simply be deducted from your available balance. Whereas, if you are on a pay-as-you-go basis, the charges will appear on your phone bill at the end of each pay cycle. What the company does is to control the money that is transferred via your phone bill as well as how it gets to the interactive casino you have chosen for your online betting session. In other words, if you have decided to make a deposit of £10 to your gambling destination of choice, at the end of the month this amount will appear in your bill or this amount will be deducted from your balance right away as long as you use a prepaid card. You will have the chance to make deposits promptly and safely which is exactly what most players are looking for. It is worth noting that Payforit can be accessed via all UK mobile networks. In addition to this, the service is also available via several virtual operators or MVNO that include Virgin and Lebara. Payments are made over an Internet connection either on a mobile network or on WiFi. When on a 3G or LTE network, the service naturally recognizes your phone number through your mobile service provider and does not ask for it. When on a WiFi connection, the service cannot see your phone number and as a result you must enter it manually. You will receive an authorization code via SMS which you must enter on the purchase page, only then will your purchase be complete. Perhaps, one of the best things about the payment method remains the fact that, in practice, everyone who owns a mobile phone can take advantage of it. What is even better is that you are not supposed to own one of the latest versions of the smartphone you are using in order to make payments with the service. With Payforit, you are not required to provide the 16-digit number code of your credit card as well which turns out to be a great advantage for some casino fans. In fact, you are not required to possess a credit/debit card or a bank account at all in order to wrap up payments via the method. This makes the service suitable for gambling enthusiasts who are not so inclined to disclose their personal or banking information when they are funding their casino account. It is worth noting that the casino operator should be registered with PhonepayPlus in order to provide mobile payment services. The casino operator should also have signed up a contract with Accredited Payment Intermediary that makes it possible to use a middleman such as Payforit when making transactions to the casino. 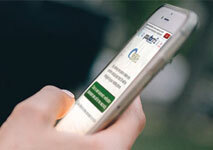 In practice, organizations like these accomplish the connection between interactive casinos and mobile networks due to the fact that they provide the needed payment gateway. This payment method does not rely on credit cards or bank accounts. Despite the fact that Payforit was designed for purchasing primarily services and digital goods, the method can also be used when you wish to load your casino account with cash. One of the preconditions to fund your account via this payment method is to own a mobile phone that uses a UK-based number which goes for all payments you are planning to make using the service. Then, you simply need to register with one of the web-based casinos that accept payments via Payforit. In fact, it will not be hard at all due to the fact that there are numerous such casinos available out there. You simply need to find the operator that satisfies all your criteria. To deposit via Payforit, just go to the cashier page of the casino. There select the ‘Pay by Mobile’ option. A pop up window will appear where you will be asked to enter how much money you wish to deposit and your mobile number. After that you will be sent a text message asking you to confirm the transaction. Once you have confirmed the payment, you will receive one more text message saying that the transaction has been wrapped up successfully. In fact, the second SMS will be your receipt and you should not delete it due to the fact that it will provide you with all the essential information you may need about the payment itself. If the transaction clears through, the funds will be immediately available and you can start playing. The whole procedure will take only a few minutes and in practice, nothing can go wrong with it, so you will enjoy a smooth gaming experience. Still, if the transaction was not completed for some reason, you will once again be informed via SMS that you should repeat the procedure. Still, if your payment did not go through, you will be informed what is the reason for this as well. What is more, you should also be informed that you have not been charged. The reason for this may be that you have reached your limit for the month or you have reached to a certain restriction set that was implemented by the network. If you are utilizing a prepaid card, however, your balance may not suffice to wrap up the transaction and in such cases, you will need to top up. To a large extent, the procedure you need to follow in order to fund your account using precisely this payment method will match, so there is nothing to worry about. This type of service is designed for one-way payments only and does not support cashbacks. As the user does not receive an eWallet, there is nowhere to withdraw any money to. Players seeking to cash out will be forced to resort to other transaction methods such as traditional checks, wire transfers or using a third-party eWallet service. At this point in time, it is unfortunately not possible to make withdrawals via Payforit so you will find yourself compelled to look for alternatives which many gambling enthusiasts may be unwilling to come to terms with. When using Payforit the customer only pays for what they purchase. There are no transaction fees for the service itself. However, the amount you can transact is strictly limited on a carrier by carrier basis. Orange customers are limited to spending £30 per month. All other carriers impose a daily spending limit of £30. Using Payforit for online subscriptions is limited to £4.50 per week, unless the consumer has prior approval from PhonepayPlus. The service is originally designed for buying from app stores or making in-app purchases, so the spending limits make sense in this context. In spite of its simplicity, Payforit is one of the most secure payment methods. To make a purchase one needs to use the mobile phone they are charging the purchase to. When making a purchase on a mobile network, your phone number will be recognized by the network. When buying something on a WiFi connection an authorization code will be sent to your phone, which you must enter to continue with the purchase. So even in the event that someone gets a hold of your mobile phone number they cannot harm you in any way. The only way to cause any damage is to physically steal a phone. Payforit is an excellent payment solution where efficiency and discretion are concerned. Using the method is much safer in comparison with using a credit card or a bank account, as the possibility for someone causing you harm is practically nonexistent. Furthermore, where bank transfers can take up to several days to process, payments made via Payforit are instantaneous, meaning that you will have the chance to start your gambling adventure right away. In fact, one of the main purposes of the service is to make payments via your mobile device easier and safer which, unfortunately, refers solely to players who reside in the UK. In addition to this, the service will provide casino fans with greater flexibility and convenience due to the fact that transactions are handled directly via their mobile phones which, on the other hand, promises that you will not encounter any issues as the whole procedure is extremely simplified. It is also worth noting that even if you are using prepaid cards, you will still have the chance to make deposits to the preferred casino via your mobile phone. Perhaps, the only problem is that you should make sure that you have enough credit in order to do so. It is also worth mentioning that a registration is not needed in order to make use of the payment service which to some extent makes it appealing due to the fact that some of the other providers of such services may require you to set up an account and to fund it prior to making payments. One of Payforit biggest advantages is that transactions via the payment method are processed in no time. Despite the fact that the service can be used solely when you wish to load your casino account with cash, at least you can be sure that your funds will appear in the balance of your account almost instantly which is the reason why some gambling enthusiasts prefer utilizing it. In addition to this, you should not pay any additional fees when using its services which is also a plus. As dependable as Payforit seems, it is unlikely to satisfy too many gamblers because of the set limits. The deposit limits are laughably small for anyone who wishes to take part in serious gambling. While budget-oriented players might appreciate this feature, high-rollers will unsurprisingly be disappointed due to the fact that amounts they are enabled to transfer are more than simply small. So, if you prefer playing big, it would be a better idea to look for another payment solution. Still, some lower-stake players may want to make use of the service but the chances for this are rather slim. If you eventually decide to take advantage of Payforit, you may turn the fact that the deposit limits are so low into your advantage as you can be sure that you will not end up with an exhausted bankroll. The idea may appeal to some gambling enthusiasts but the fact that the limits of the transactions you can make are so low undoubtedly remains of the biggest drawbacks that cannot be neglected. Coupled with the fact that withdrawing funds is impossible, the service becomes ill-suited for gambling purposes. Despite the fact that you will potentially get a refund if you have decided to return something you have bought using the service, this does not refer to retrieving your funds from your web-based casino of choice which undoubtedly is a major drawback. 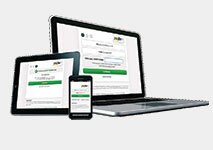 To use the Payforit service you have to disclose your mobile phone number. Some people might take up an issue with this as it might lead to a breach in their privacy. Some unscrupulous sellers may also choose to send you promotional texts or ads directly to your personal phone which many gambling enthusiasts will find quite unpleasant. Also worth noting is that Payforit provides the network for the transactions, but does not police them. This means that any extra charges or disputes must be resolved between you and the seller or online casino directly. On top of that should your phone be lost or stolen, you are liable to pay up to £100 for charges made on that device after the fact. 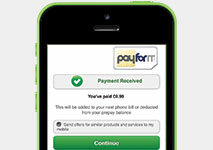 Payforit is a service only available to consumers who own a phone with a UK phone subscription. People from outside the United Kingdom have to make use of another online payment solution which is also a major setback due to the fact that many of the other payment options available out there can be utilized by gamblers from a wide array of countries, not solely from a single one. Payforit is an excellent service when it comes to making instantaneous payments via your smartphone. Still, the payment method has several drawbacks that should be taken into account prior to opting for it especially when it comes to using it for gambling purposes. Perhaps, many gamblers will be unwilling to utilize it due to the fact that the transaction limits are really low as they cannot deposit more than £30 per day which makes it more suitable for micro-transactions. What is more, you will not have the opportunity to make use of it when you wish to cash out your winnings which will compel you to look for other options. With that being said, some gamblers may find themselves forced to search for other online transaction methods that will surely satisfy their needs better but it is all up to you to weight both Payforit’s advantages and disadvantages and to decide whether or not it is the best options for you.